Sen. Elizabeth Warren (D., Mass.) will attend an immigration conference next month with Women's March organizer and liberal activist Linda Sarsour, who has come under increased scrutiny for her ties to radical Nation of Islam Minister Louis Farrakhan. Both Warren and Sarsour are slated to speak at the National Immigrant Integration Conference in Arlington, Virginia. The conference, which will run from Dec. 9 to 11, is the largest immigration conference in the United States and "plays a central role in the powerful, diverse and broad immigrant and refugee rights and integration field," according to its website. "At the NIIC, the many different spokes of this field gather to develop relationships, build campaigns, amplify shared values, be inspired, build relationships, and share ideas, strategies, lessons learned and new information and innovations," the website reads. "It is an important space for leaders and organizations, and strengthens collaborations and partnerships that power work at the local, regional and national level." Sarsour, a Palestinian-American, has a long history of anti-Israel rhetoric, including a speech in 2015 at a Nation Of Islam event. She has also discounted anti-Semitism, saying that "while anti-Semitism is something that impacts Jewish Americans, it’s different than anti-black racism or Islamophobia because it’s not systemic." At a June 2018 event hosted by the Center for Constitutional Rights and the Justice Delegation, Sarsour said "Palestine is the global social justice cause of our generation" and that there is an "apartheid happening in Palestine, funded by our taxpayers' money." At the same event, she pushed back against people calling her anti-Semitic, saying, "When you hear people calling me an anti-Semite, or saying that the CCR [Center for Constitutional Rights] is an anti-Semitic organization, you have to stand up and say no! Because actually it’s a disservice to Jews to call people like us anti-Semites when there are true anti-Semites in the White House!" While Sarsour has been praised by many liberals for her activism with the Women's March, the founder of the group called on her and other leaders associated with the group to step down last week for permitting racist rhetoric and anti-Semitism to take over the movement. "Bob Bland, Tamika Mallory, Linda Sarsour and Carmen Perez of Women’s March, Inc. have steered the Movement away from its true course. I have waited, hoping they would right the ship. But they have not," Teresa Shook wrote on Facebook. "In opposition to our Unity Principles, they have allowed anti-Semitism, anti- LBGTQIA sentiment and hateful, racist rhetoric to become a part of the platform by their refusal to separate themselves from groups that espouse these racist, hateful beliefs. I call for the current Co-Chairs to step down and to let others lead who can restore faith in the Movement and its original intent." Sarsour responded by penning a letter expressing her apologies for not disavowing Farrakhan sooner. The NIIC isn't the first time that Warren, who has been floated as a potential 2020 presidential candidate, will have attended an event with Sarsour. 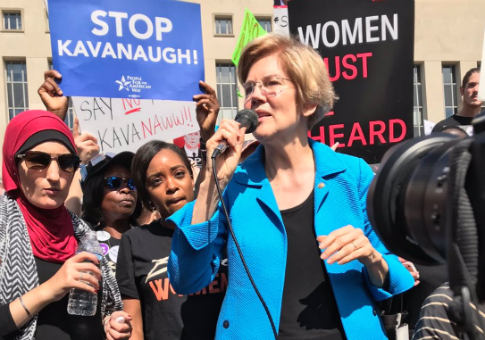 Last month, Warren attended a rally protesting Supreme Court Justice Brett Kavanaugh's confirmation alongside Sarsour and Tamika Mallory, a Women's March co-founder. Democratic Reps. Luis Gutiérrez (Ill.) and Pramila Jayapal (Wash.), as well as Virginia delegate Elizabeth Guzmán will also speak at the NIIC. This entry was posted in Politics and tagged Anti-Semitism, Elizabeth Warren, Linda Sarsour. Bookmark the permalink.